Block 2 is a Starburst. 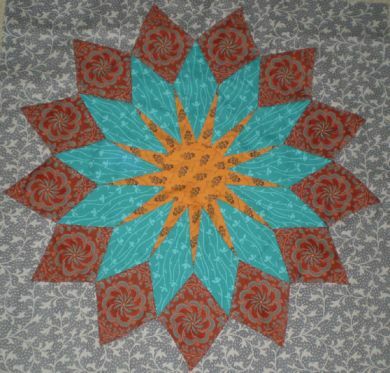 The pattern has full instructions on how to make the block, and full sized templates suitable to hand piecing. Each month you can download a new pattern for this 9 block traditional hand pieced quilt by Wendy Whellum. Each block is 18" finished and can be used on it's own, or in a sampler with the other 8 blocks of the set. To purchase the pattern, put it into your shopping cart, and proceed to the payment screen. You can then pay with either your credit card, or with Pay Pal. You will then receive an email, with a link. You must click on the link which will enable you to download the pattern. This must be done within 3 days.